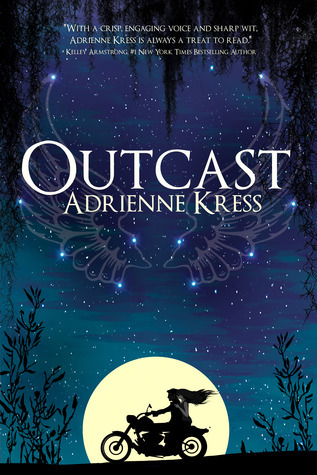 Outcast by Adrienne Kress. Diversion Books, 2013. Currently Available. Face Value: I read this one on e-book (which I only acquired recently) so I didn’t spend as much quality time with the cover as I would normally in a print book. But still, I say yes to this cover, which has a great use of color, lovely illustrations, and is absolutely reflective of the story. Does it Break the Slate? Totally. Riley is both relatable and admirable, bringing toughness, compassion, and a healthy dose of skepticism to her town’s strange circumstances. She is the true hero of this story, and it’s great to see such a richly realized young women at the center. Who would we give it to? Sure there’s a fantasy element, but what I really loved about this book was the relatable small town experience that Kress captures beautifully and the smart interactions between characters. If you’ve pushed through Sarah Dessen’s canon already and are willing to try something a little out of the box, you might really enjoy Outcast. And of course, if you like well-plotted realistic fantasy, then you’ll enjoy this too. Review: For the past six years, angels show up once a year in Riley’s town. Real angels, scary biblical ones, who come from the sky and take people back with them, people who are never heard from again. It’s frightening, and inexplicable, and over the years people have found their own explanations for why it happens. But most of them have come to the conclusion that it’s a religious choosing of some kind, and Pastor Warren has built a ridiculously successful Church of the Angels based on that principle. Everyone in the town buys into that, because – well – they have to. But a year ago, Riley’s best friend Chris was taken by angels. So this year, when she stays home from the ceremony, she ends up shooting an angel in the face. When she shoots the angel, it turns into 17 year old boy named Gabe who seems to think it’s 1956. And Riley and Gabe together start to piece together the town’s mysteries, and realize it’s more complicated than anyone realized. The premise of Outcast is a strange one, and I definitely was skeptical just from reading about it. But it’s so well crafted, with such complex characters and well-structured mythology that I was in love with it from the start, and only enjoyed it more as the secrets were revealed. “The first time it happened, it freaked everyone out. This was a god-fearing land. It said so right on the town sign. You knew the second you passed into our community that this was a goddamned god-fearing place. So right away we know that this isn’t necessarily a religious book. Riley and her parents aren’t religious – they just know enough about their town to stay quiet about their skepticism. But while Pastor Warren turns out to be corrupt and villainous as one might expect, there are plenty of religious characters who are thoughtful, respectful and heroic. So this is a book that can be read and enjoyed by people of all different religious backgrounds. Riley is the best. I loved her and a character and totally empathized/identified with her. She is a Slatebreaker, both because of her complex/dynamic characterization, her general attitude, and because she, you know, ultimately LEADS A TEAM OF REBELS in a bold overthrow of her small town’s system. But Gabe is also pretty fantastic, and the relationship that develops between them, both friendship-wise and romantically is plausible, complicated, and pretty smoldering. There are also some really interesting explorations of female friendship, and a wide variety of female characters. Like in Kress’s earlier work The Friday Society, she plays with the “tropes” of characters, and what we expect of young women, and turns those tropes into interesting complications and realizable humans. Same with Riley’s parents, who are wonderful, interesting parents as well as wonderful, interesting characters. Nice to see. I really enjoyed Kress’s The Friday Society, and reviewed it positively on this blog last winter. But I loved Outcast even more. Instead of playing with history and traditional tropes to build characters and action, here she has crafted a totally new mythology, with really original and engaging characters. Her range of skill makes me particularly excited to keep reading her work. Reviewed from an ARC received via NetGalley. This entry was posted in Reviews, Young Adult and tagged Angels, Mythology, Religion, Small Town, Speculative Fiction. Bookmark the permalink.